When I signed up for the Books That Made Me Love Reading Challenge, I knew the first book I'd read would be a Berenstain Bears book by Stan and Jan Berenstain. Those were the books I loved best as a kid - I remember my mum, dad, and Grama reading them to me, and then when I learned to read, I would read the books to them. I'm sure part of the fond memories of these books tie into the fact that my dad bought most of my collection, and he died when I was ten. I used to choose one every time we went to the post office, which was situated in the back of a small department-type store. I loved the Berenstain Bear books because they were relateable for me. Their family was my family - mother, father, older brother, and little sister. Any important life lesson or value you needed to learn as a child was found in these books - friendship, honesty, trust, responsibility, you name it. 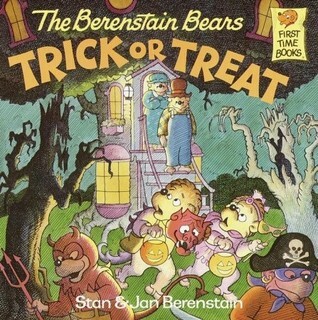 The Berenstain Bears Trick or Treat was always my favorite of the series, probably because I've been obsessed with Halloween for as long as I can remember. The book was first published in 1989, and that's likely the year I got it. I've read it so many times over the years, it's falling apart. I loved the story itself, the illustrations, everything. "The sights and sounds of autumn were all around as Mama Bear pushed her shopping cart along the path that led to the Bear family's tree house. The trees and shrubs were ablaze with colour. Farmer Ben's pumpkins stood bright orange in the October sun. The crows cawed noisily as they searched the stubble for bits of corn. Wild geese in great V-formations honked high in the sky as they flew south." Doesn't that evoke such great, vivid imagery? I love that it's not over-simplified or 'dumbed down' like so many children's books. In the story, this will be the first year that Brother and Sister get to go trick-or-treating with just their friends, and no adults along. Mama and Papa set down rules like staying in the neighbourhood and not eating any candy until they return home. The main lesson of the book is that appearances can be deceiving - a scary costume hides a normal person, and some people who appear to be something (like the 'witch' who lives down the road in a 'gnarled, twisted old tree house') aren't always what they appear to be. I think that's a very important lesson for kids (and possibly some adults I know, haha). I still love this book now as much as I did when I was a kid. I haven't decided on next month's childhood favorite yet; it's a toss-up between On Fortune's Wheel by Cynthia Voigt and Tuck Everlasting by Natalie Babbitt. I only read a handful of Berenstain Bears books when I was a kid but they were definitely cute from what I remember. It's funny you mention Tuck Everlasting because that movie was just on today! Berenstain Bears, oh yeah! I know I read them, but only remember the one with the honey tree off the top of my head. Papa was always SO cranky :-P Thanks for reminding me of these gems. And I'm super impressed at how well thought out your book review was. My review of Harold and the Purple Crayon was far simpler!